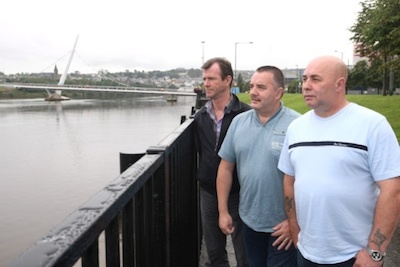 There was news this week that the prosecution of former RUC members over their abuses of nationalist youths in the original ‘Derry Four’ case has been inexplicably dropped, following communications between Crown prosecutors and the Police Ombudsman. In this article, Martin Galvin looks back at a notorious episode in policing in the North. The prosecution of former RUC members stemming from the Derry Four case raises an ‘appalling vista’ of British injustice. Those words were famously used in another case of innocent Irishmen beaten into making false confessions. Were their appeal allowed, said Judge Denning, it would raise an ‘appalling vista’ that constables had been guilty of perjury, violence and threats to convict innocent Irishmen, and so added a decade to the appalling imprisonment of the ‘Birmingham Six’. Michael Toner, Gerry Kelly, Gerry McGowan and Stephen Crumlish are already proven victims of just such an ‘appalling vista’. Arrested in 1979 after the IRA shot a British Lieutenant, these teenagers were clearly innocent. They were brutalized at Strand Road until they confessed. Witnesses to their innocence were told to go home or be charged. The Derry Four got bail then fled their city, their families, and future hopes to escape 15 years in the H-blocks. Innocence and witnesses would not have saved them. Diplock judges of the day routinely rubberstamped RUC stories of voluntary confessions tied to self-inflicted injuries. Their innocence would not be proven until the courts dismissed all charges 20 years later. Any true definition of victims should surely include innocent men and women beaten into false confessions and wrongly imprisoned or forced into exile. They are victims of crimes of assault, perjury and conspiracy to pervert justice. Some have seen their confessions belatedly stricken. Some even received monetary damages. They have not seen the guilty punished. It should be noted that after the British shifted from internment to Diplock Courts, so-called ‘Castlereagh confessions’ made up the only evidence in four out of five cases. Human rights activists like Fr. Murray and Fr. Faul documented hundreds of instances of RUC brutality during interrogations in their pamphlet Castlereagh Files. Amnesty International investigated 78 assaults on suspects and demanded an inquiry. Dr. Robert Irwin, a police doctor went public on ITN news about 150 assaults during questioning, and was publicly smeared. Bobby Sands wrote poems like The Crime of Castlereagh and Diplock Court. The British covered-up and condoned these abuses. Those who meted out beatings, forced confessions and then swore to voluntary statements had no reason to doubt they had the full backing of the crown and constabulary. There can be few wrongs more likely to bring justice into disrepute, than innocent men and women sent to prison by forced confessions and perjury. Can the crown give overdue justice to victims of assault and perjury committed by the RUC? Despite all changes, does this ‘appalling vista’ of impunity still corrupt British rule and law?